HOME BACKUP POWER. COMFORT. SECURITY. COME WHAT MAY. Are you tired of losing power during every big summer or winter storm and consequently losing productivity at your business? In 2000, U.S. companies lost a whopping $80 billion due to electrical interruptions. Security systems go down, refrigerated food spoils and customers are lost and turned away. Even for a small business, a power outage can translate to thousands of dollars an hour in lost revenue and productivity. There’s no reason for your business, whatever size it may be or its scale of operations, to have to lose revenue due to a power outage. It’s time for you to call Sunderland Electric so that one of our licensed electricians can install a standby commercial generator in your business place. 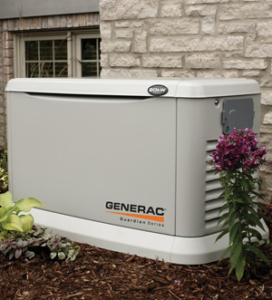 We can install a Generac standby emergency generator for you so you’ll never have to worry about the disruptions caused by extended power outages again! A backup generator installation more than pays for itself. 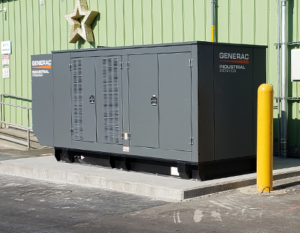 more reliable and less expensive to run than portable commercial emergency generators, and require no input on your part—they start and stop automatically. 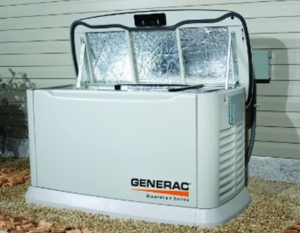 If you are insterested in a Generator for your Home or Business call Sunderland Electric Today!